The range of apparatuses produced by ERMES for the Emergency Call Systems Over IP includes an unit in which the SOS function integrates with the function of sound broadcast. In fact, this unit is equipped with a 40W power amplifier capable of driving one or more external speakers connected through a 100V audio line. 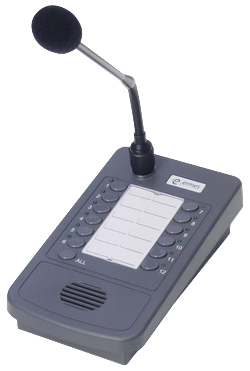 Thanks to this combination of functions, the HelpLAN can be used in all cases where, as a result of an emergency, is required to broadcast an announcement or an audible alarm signal. On the Help Point, in fact, several audio files of a total duration of 2 minutes can be stored that can be played by a command sent by a console or triggered by the closing of an input on an I/O module. Audio files can be either voice messages or audio tones indifferently. 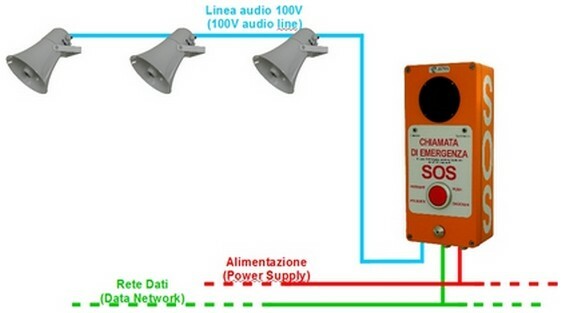 In addition to the managing of the emergency situations, the system can be used to disseminate service announcements or background music in the area where it is installed because the SOS function and the sound diffusion function can be managed in a completely independent way. The network connection in these systems, as well as in the other Over IP systems produced by ERMES, can be made with any type of technology: copper, fiberglass, WiFi or any other type of solution that ensures the availability of a standard ETHERNET connection. 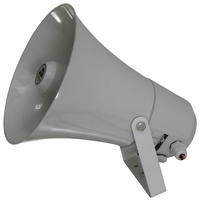 Depending on the type of environment, you can use different types of loudspeakers to connect to the Help Point for the realization of the sound distribution lines. 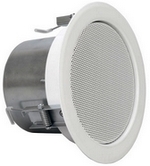 They are available, horn loudspeakers suitable to be installed outdoor in large areas as well as ceiling loudspeakers and wall loudspeakers for indoor installations. The speakers to be used must be of the type with 100V audio line transformer and are simply connected in parallel to a pair of conductors.